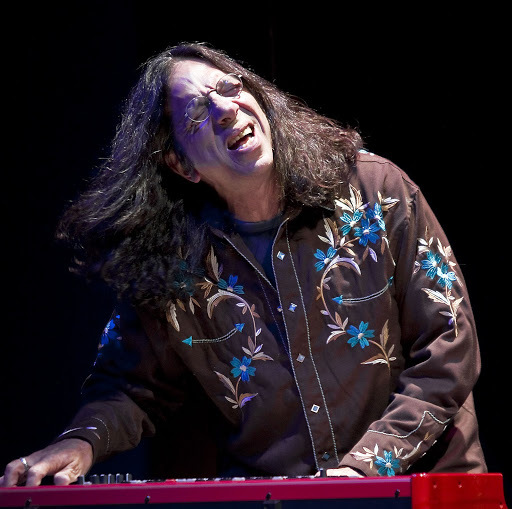 Katz’s playing is brilliant, powerful, versatile and can take soaring flights or dig deep into the groove. If you are a fan of Hammond B-3 virtuosity, you need to see Katz. He’s one of the best working today, a must for fans of soulful playing and serious musicianship. He’s touring in support of his recent disc Homecoming, which has hit the Top 10 on Living Blues magazine’s radio chart. See brucekatzband.com. Enjoy Katz and his band up close and personal in their only Nebraska show at Lincoln’s Zoo Bar Wednesday, June 3, 6-9 p.m.
Detroit’s Laura Rain & The Caesars are making their mark on the retro-fueled R&B scene. If you like Josh Hoyer & The Shadowboxers or Sharon Jones, you’ll get into Rain’s bright, soulful R&B/funk grooves. Blues Revue’s Tom Hyslop said of their debut disc that it is “uptown and lowdown, hungry, vivid, and confident…just plain badass” adding that “very few vocalists are in her class when the discussion gets serious about technique, instrument, emotion, and absolute freedom of expression. Laura Rain is a real soul singer, period.” Hear their whole disc streaming at laurarain.net. I like what I hear a whole lot and am looking forward to seeing this band live. Laura Rain & The Caesars play The 21st Saloon Thursday, June 4, 6-9 p.m.
Steel guitar star Robert Randolph plays Knickerbockers in Lincoln Friday, May 29, 9 p.m. Opening is the Hector Anchondo Band. Randolph is one of the finest guitar players working, with a virtuosity on the pedal-steel that is inspired by the Pentecostal sacred steel traditions of the south and players like The Campbell Brothers. Sidebar: The Campbell Brothers throw down their influential steel style at Playing With Fire Thursday, June 28, at Midtown Crossing. See playingwithfireomaha.net. Singer-songwriter-guitarist Eric Taylor is a remarkable songwriter with a gift for words, stories and performance. He spins character studies that may or may not be lifted from real-life encounters with a depth and lyricism that keeps the listener riveted, sometimes with laughter and sometimes with a tear or two. Taylor is a master at his craft who started out in the same Houston scene that artists like Townes Van Zandt, Guy Clark, Steve Earle & Lyle Lovett learned their craft in. Taylor plays Omaha’s FolkHouse concert series coming up next Saturday, June 6, 7:30 p.m. See folkhouseconcerts.com for the house concert location and to RSVP. Taylor also has a gig Friday, June 5, 8 p.m. at Shenandoah’s Depot Deli, a cool restaurant just an hour’s drive from Omaha that books some great shows. See facebook.com/DepotDeli. Taylor regularly plays events like the Kerrville Folk Festival and the Telluride Americana Festival. Taylor is a Hoodoo favorite who only makes it to Omaha every couple of years. For more about Taylor see bluerubymusic.com. Dean Dobmeier’s and Gary Grobeck’s Sunday Roadhouse hosts the high, lonesome vocals and banjo-driven duo Olympia, Washington’s, The Lowest Pair Sunday, June 7, at Reverb Lounge. Paste Magazine says “with their bare-bones instrumentation and country-inspired, heartstring-tugging narratives, The Lowest Pair might be one of the best under-the-radar Americana duos today.” Visit thelowestpair.com and sundayroadhouse.com. Next weekend check out the Soaring Wings Blues Fest at Soaring Wings Vineyard. See soaringwingswine.com for all the details. Also next weekend, the annual Summer Arts Fest brings great live music to downtown including the rockin’, guitar-driven blues of Mike Zito & The Wheel (Friday, 7 p.m.), plus Moreland & Arbuckle (Saturday, 5 p.m.) and Chubby Carrier & The Bayou Swamp Band (Saturday, 7 p.m.). See the full schedule at summerarts.org/music. Steve Byam’s 40SINNERS is back in action with a standing “first Thursday” gig at the Harney Street Tavern in the Old Market. See what this local blues guitar slinger can do Thursday, June 4, 9 p.m.
Lots of music this weekend moves outdoors, starting with the SouthPointe Pavilions 7th Annual Lincoln BBQ and Blues Fest Presented by Famous Dave’s Saturday, May 30, 4-10:30 p.m. at 2910 Pine Lake Rd. (in the parking lot east of Famous Dave’s) Playing are The Geezer Brothers (5 p.m.), Chicago’s Kilborn Alley Blues Band (7 p.m.) and Josh Hoyer & The Shadowboxers (9 p.m.). Admission is $5 per person, children under 10 are admitted free. Sunday, May 31, Omaha’s Bel Air shopping center, 120th & West Center, presents their fifth annual Free Blues Festival. Performers are a reprise of last year’s bookings since last year’s event was rained out. Catch the wonderful Bel Airs (4 p.m.), Brad Cordle & The Mighty Jailbreakers (5:30 p.m.) and Josh Hoyer & The Shadowboxers (6:45 p.m.). BluesEd’s Mojo Bag opens the show at 3 p.m. The downtown Hilton, 1001 Cass St., has put together a Sunday afternoon concert series in their Liberty Tavern’s north patio. Featured this weekend is jazz from Matt Wallace Sunday, May 31. Music is free and bands play 5-8 p.m. A variety of artists are scheduled including Austin’s Band of Heathens, who are appearing Sunday, June 14. Kansas City’s Old No. 5’s play a free show at Waterloo’s Dog House Saloon Friday, May 30, 7-11 p.m. See oldno5s.com. The Bel Airs are up at Lincoln’s Zoo Bar Friday, May 30, 5-7 p.m. and Saturday, May 31, 6-9 p.m. Kilborn Alley Blues Band brings their greasy Chicago-style blues to The Zoo Friday, May 30, 9 p.m.